Concrete equipment manufacturers are carrying out new advancements in their products line apart from making new launches for emerging applications.P.P.Basistha finds out the details. 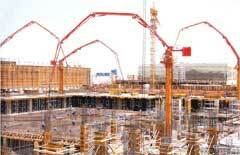 All-round technical developments are taking place in concrete placing equipment across the verticals once again. Responding to the changing requirements of the contractors, manufacturers are incorporating technical modifications in the products line wherein some of the changes are stated to be quite refined in nature. The new advancements being carried out by the concrete equipment manufacturing industry are quite significant, keeping the major innovations in view done in the past; and whenever there was requirement of higher job volumes, the concrete mobile batching plants were produced. The mobile plants have been found to yield good results working at crammed job sites. The new technical modifications are being made in order to provide less operating costs considering higher pricing spirals in cement and other raw materials coupled with rising labor costs, amidst shrinking job volumes. 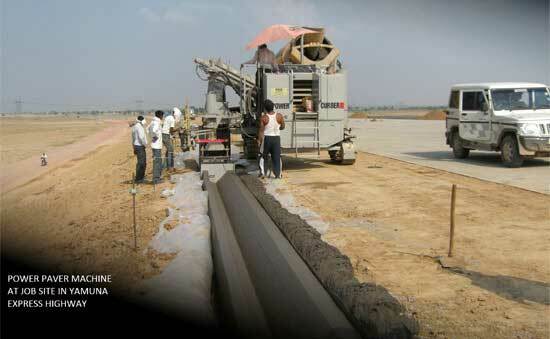 Wide range of concrete placement equipment is manufactured by Man Force Trucks. 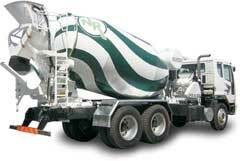 The company offers transit mixers from4 c‎um mixer on a 4X2 chassis to a 10 c‎um mixer on an 8X4 Chassis. The mixers are offered by Man Force under collaboration with Schwing Stetter India Pvt. Ltd. (SSIPL) and Liebherr India. Man Force offers after sales and service through a network of more than 150 service outlets & 45 main dealers, all equipped with service vans and spread across the length and breadth of the country. The company’s state-of-the-art advanced service training center at the Pithampur factory provides training to customers’ drivers and technicians on free of charge basis. He mentions, “Putzmeister’s core focus has been in manufacturing concrete pumps and placers ever since its inception, we have developed requisite engineering expertise which are incorporated in our concrete boom pumps. The features have been put in place depending on worksite requirements, not to mention to cut down concrete placement costs. In accordance with this, our pumps can provide variable concrete output by slow pumping when there is an extension in feed schedules. Reliability of the machines is ensured through components procured from globally reputed brands, involving hydraulic pumps from Rexroth. While extended life of the boom pumps are ensured through high grade steel, chrome plated cylinders among others.” Putzmeister’s pumps come with s-valve technology. Putzmeister, which indigenously manufactures its boom pumps and trailer mounted concrete pumps at its manufacturing set up in Goa, procures non-core components like Hoods, frame etc. from domestic sources and engines from Kirloskar, so as to keep the cost of the product competitive. Putzmesiter’s concrete boom pumps for Indian market are made available in 20-32-36-38-42-46 metres and on AMW, MAN, Leyland and Volvo chassis based on customer’s choice. Putzmeister’s higher reach boom pump is available in 70 metres of height. Taking into consideration, the existing high demand potential of the market, given the large scale of infrastructure development across sectors, concrete placers manufacturers are positioning their products accordingly. 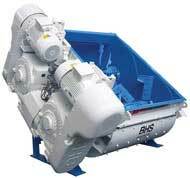 Sany also makes available transit mixers with capacity of 6 c‎um/hr fitted on Ashok Leyland and AMW chassis. It will shortly launch 8-10 c‎um/hr capacity transit mixers on Man Force and AMW chassis equipped with power take off engines. The equipment manufacturing major provides service support to its concrete equipment through its 21 dealers and 6 own regional officeswith warehouses and service centres located across the country. Component support is provided from its mother warehouse at Panvel in Maharashtra. The existing and emerging potential in concrete placing segment is also being counted by Revathi Equipment Limited (REL). REL presently manufactures Trailer mounted Concrete Pumps and concrete boom placers of 17­36 metres in technical collaboration with Waitzinger Gmbh of Germany. According to Mr. M. Sunil, Associate VP (Marketing) Construction Equipment Division, “there is emerging potential in smaller capacity boom placers, due to the extensive Road construction work undertaken in the country and Budget Housing projects. Our 17 meter concrete boom placers mounted on a compact 2 Axle chassis is one of the most cost effective solutions in this category of small Boom Placers.” The 120 bar, high pressure pumping unit can handle most type of Mix designs and ensures smooth pumping and high equipment utilization. REL’s concrete equipment, which include the complete range of Batching Plants, Concrete Mixers and Pumps, are serviced through its 6 offices and 15 trained dealers across the country. Trials on the machines are being planned inNarmada Project -Gujarat in certain canal projects being constructed in the state. Following the trials, Conmat plans to launch the product in April 2012. The company which has standard Cylinder Paver Finishers for construction of main irrigation chanals have carried out technical modifications in the same by replacing hydraulic gear motors with new electrical gear motors. Mr. Kudva said, “the spillage of hydraulic oil when topping-up or bursting of hoses due to extreme heat severely affects quality and the strength of the concrete. 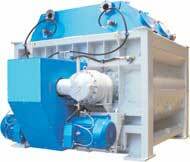 The electrical gear motor comes with pre-concealed form arresting chances of oil spill. Besides, they are much less prone to maintenance.” The motors are being imported from Bonfig of Italy and SEW of Germany. The new modification has enhanced the concrete output of the pavers from earlier 12-15 c‎um/hr rated output to 25 – 30 c‎um/hr at present. Conmat’s recent launch of fully Automatic Mobile Concrete Batching Plant with Twin Shaft Mixer has been well appreciated & acknowledged by construction companies especially Real Estate/ Building construction sector. 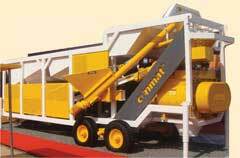 CONMAT is planning to launch support equipment for CANAL lining like soil compactors, trimming & side discharge conveyors very soon. Also the compact version of slipform paver Power Paver SF-1700 is the one which is to be noted for the features and competitive price at which allen buildwell offers. 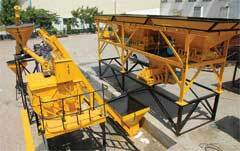 Allen Buildwell manufactures concrete batching plant in India. It represents US company Guntert and Zimmermann for slip form pavers in India apart from representing Power Paver and Power Curber, Allen Engineering for concrete pavers of US. It also has a marketing collaboration with Dici of Italy to market its low bed dumpers and self-loading truck mixers for construction of tunnels in India. At par with carrying products improvement by original manufacturers in concrete equipment placers to reduce production costs, component suppliers to OEM’s are also looking for providing better products and customers support. According to Mr. Neelesh Desai, National Sales Manager, BHS Sonthofen India, “to provide better products support to the OEM’s in terms of parts availability, we are setting up our new 7,000 sqft warehouse at Indirakaran on Mumbai-Hyderabad road. The location of the new warehouse is 40 kilometres away from Hyderabad. To provide customers support to the OEMs, to whom we supply the equipment; we have set up a new service team which imparts training to the OEMs through scientific methods. Mr. Gajendragad said that Sicoma would continue to undertake marketing of the products through its own marketing network. 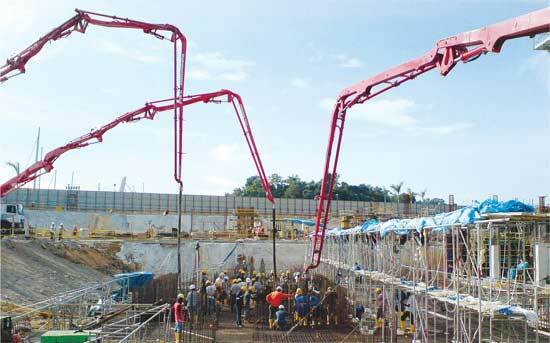 Sicoma offers concrete planetary mixers and twin shaft mixers. Sicoma’s customers include, Apollo Infratech, Macons, Aquarius Engineers, Allen Buildwell, Akona Engineering, etc. Cosmos manufactures inline batching plant, fully automatic reversible drum batching plant, twin shaft in line batching plant, boom scrapper batching plant, tower crane, suspended rope platform, transport platforms, tough rider articulated type etc. The technical modifications and new launches of concrete equipment augur well for the construction sector passing through mechanization for achieving timely project completion. It also sounds well to keep in check cost of concrete production and placement in the present scenario when inflationary pressures are impacting the sector. The progress needs to be sustained for good.